(Photo credit: Sumio Yamada) Amir Khan liked what he saw of Lucas Matthysse last night in his easy 3rd round TKO win over Lamont Peterson at the Boardwalk Hall in Atlantic City, New Jersey. However, Khan saw things in Matthysse’s fighting style that he feels would enable him to beat the Argentinian and he says he’d like to fight him. Khan is moving up to 147 in his next fight, so it’s easy for him to say all this stuff now about wanting to fight Matthysse when it doesn’t look like it’s doable. Golden Boy Promotions will be matching Khan up with either IBF welterweight champion Devon Alexander next or Floyd Mayweather Jr. Regardless of which fighter Khan faces, his chances of winning are not that good. In fact, I’m giving him zero chance of beating Mayweather and only 10% chance of beating Devon Alexander. Most likely Khan’s experiment at 147 is going to end in failure with him getting knocked out when he’s put in against quality opposition like Mayweather and Alexander. Matthysse vs. Khan would be interesting fight on paper, but probably not a good fight in reality. Matthysse has too much power and Khan’s chin is just too weak to take the kinds of shots that Matthysse can land. Khan has problems facing opponents with powerful left hooks, and that’s one of Matthysse’s best weapons in his arsenal. We saw how Breidis Prescott, Danny Garcia and Julio Diaz were both able to hurt Khan with left hooks. Now imagine Khan facing a guy like Matthysse with an even better left hook than Prescott, Diaz and Garcia, and we’re looking at a fight that would be lucky if it made it past the 1st round, even with Khan running for his life. 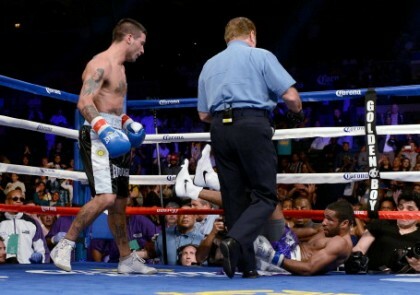 Matthysse also has a right hand that is nearly as powerful as his left hook. It just wouldn’t be a good fight for Khan. I predict that Khan will be knocked out in his next fight, and then Golden Boy will have to pull him back from facing top tier opposition again and put him back on a soft diet like the one he’s been on in his last two fights since being stopped by Danny Garcia last year in July. Khan says his chin will be better now that he’s moving up to 147, but I don’t buy that for a second. I see his chin being just as weak as before.